I had hoped to finish up my Urban Windows quilt today but after loading it on the new longarm at Quilter's Way I realized my backing was 4" too short. Ooops, epic fail! I did manage to finish up my pincushion for the MQG swap that's due tomorrow. Nothing like leaving it to the last minute! 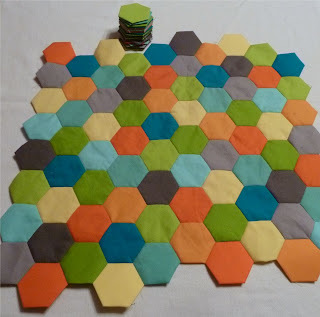 I used some of my carefully hoarded Joel Dewberry Hope Valley and machine pieced the hexagons using this fabulous tutorial by Jacquie at Tallgrass Prairie Studio. It really is as easy as she makes it look. I used Essex linen on the back and stuffed it with Bamboo fiberfill. I hope my swap partner loves it as much as I do!!! I've definitely been hexed this week! Only two more rows to go on my hexie blob wall hanging. Check out what these amazing quilters are doing on Finish it up Friday over at Crazy Mom Quilts. Your pin cushion is super cute. I love it how you got Audrey & her friends into quilting too. Some day I want to share the same obsession of quilting with my daughter. Our first session was good, but she hasn't asked for it after that though. Need to get back to it soon. I love hexi's too! 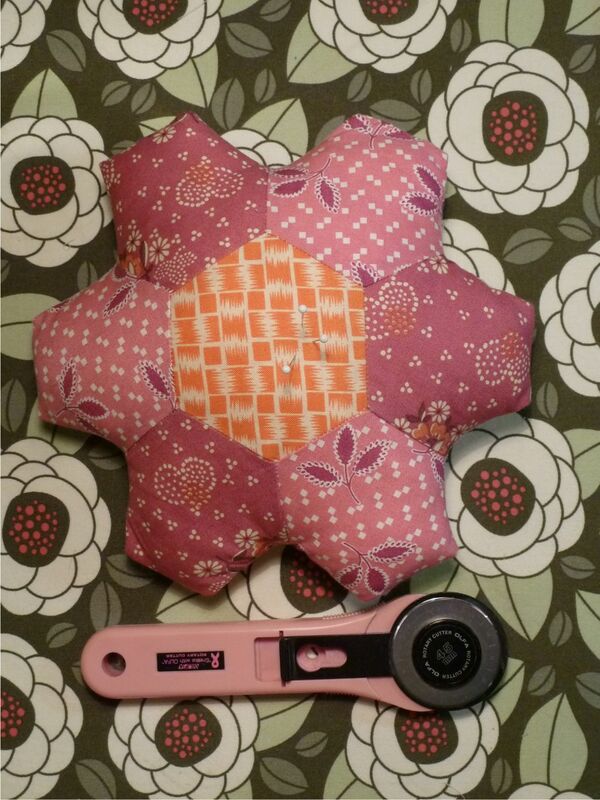 I can't wait to see your finished hexi blob. Everything is so cute, and it's wonderful to see you pass along some sewing skills to these young ladies. I bet they loved it.